Posted in Empower Sales Conversations, Improve New Product Launch, Increase B2B Sales, Presales, Pricing, Product Management, Product Marketing, Quantify Customer Value, Sales, Why LeveragePoint? 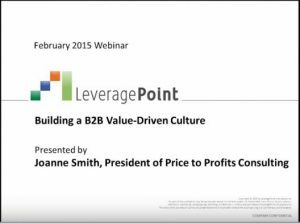 Joanne Smith, President of Price to Profits Consulting and former Corporate Director of Marketing and Pricing at DuPont, will share practical steps on how to build a value-driven culture at a B2B enterprise. Based on her professional experience at DuPont, she will describe the activities that leaders need to take to embed the passion, urgency and competencies in their organization to increase profitabilty. The synergies between value pricing and customer loyalty/growth. Joanne M. Smith spent 20 years driving profitability from a variety of business, marketing, and pricing leadership roles inside DuPont, and is the author of “The Pricing and Profit Playbook”. As the Corporate Director of Marketing and Pricing in DuPont, she headed a highly innovative pricing team that influenced senior leaders including those in the marketing and sales organizations to adopt new market-based approaches. 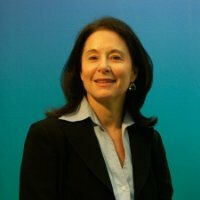 Currently, she is President of Price to Profits Consulting which assists B2B companies in transforming their pricing performance to enhance long-term profitability.